The Ion Age Blog: IAF073 Amber Portable Weapon (6 Variants) and IAF074 PM Gun Crew released! IAF073 Amber Portable Weapon (6 Variants) and IAF074 PM Gun Crew released! 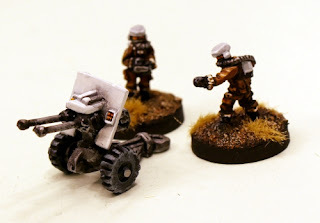 The Hazelwurm Patrol Car skidded to a halt its right rear tyre shredded by 9.6mm Maia mpi rounds but its precious cargo of troopers safe in its lightly armoured body and the Amber portable weapon it was towing safe also from the withered fire of the Maligs. As quickly as they could the troopers climbed out of their seats and dived for the rear of the patrol car to uncouple the portable weapon. Bullets whined and ricocheted from the Hazerlwurm as another patrol car pulled up at the intersection and a fire-team of troopers got out and from behind their car began to lay down rifle fire to keep Goblins busy. It worked and the bullet strikes began to focus upon the second Hazelwurm giving the gunners time to get their weapon into a good position from there it could be remotely operated from behind the vehicle's cover. Their Amber was a stubby twin barrelled Moth 88 cannon perfect for infantry suppression and through their helmet arrays the gunners tracked the sights of the gun onto the Maligs across the intersection. Maligs were vicious killers but they were not the smartest soldiers of the Khanate Empire and as the Moth 88 opened up with a roaring echo like a giant tearing sheet metal to strips they died. The swarming bullets of the Moth 88 literally tore the Goblins to pieces and left them little more than a smear on the rubbacrete. Following up on the excellent IAF071 Planetary Militia 3rd Squad last week we present the rest of our releases for June 2015. There will be no more releases before July. The Planetary Militia get their own portable weapon in the Amber and gunners to operate it. 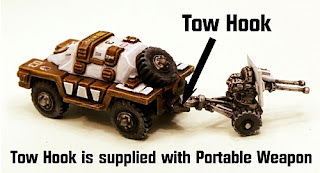 With six variants and a wheeled chassis and tow hook it can be moved with ease on low tech worlds and behind your vehicles such as the Hazelwurm. Read on for more details! The Amber is a portable weapon platform on two wheels which acts as support for infantry. The core pieces are the two wheeled stand, the housing block and the gun shield as well as a tow bar piece to attach to any Ion Age vehicle. These are the same in all variants and onto this is mounted one weapon. The options are Moth 88 twin long barrelled cannon (A), Moth 88 rotary cannon (B), Angis AP Cannon (C), Bodkin Howizter (D), Valerin Laser Cannon (E) and the Fretan Rail Gun (F). Weapons mount one of two ways with the gun shield fitted over them or around them. This weapon system is a brother to the Espaten protable weapon used by the Retained and Muster in battle. Here is an image which shows all of the parts which are used to make up one and all variants of the Amber Portable Weapon platform. Here is a picture of the tow bar as it is to be used on any of The Ion Age vehicles but especially the Planetary Militia ones. This pack contains two 15mm scale white metal miniatures in different poses. Two Planetary Militia Troopers with the first arm raised checking ranges and the second with the remote control box for the Amber Portable Weapon. 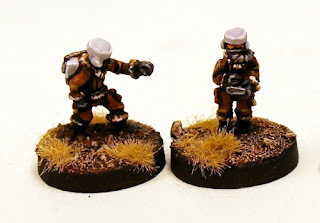 Combine these portable weapon crew miniatures with the IAF073 Amber Portable Weapon or the IAF064 Espaten Portable Weapon Platforms. Go HERE. As always this code can be bought as a pack or as single miniatures or select the three packs and save 10% option on the page. Price 1.00GBP per pack. IAFP07 Planetary Militia Platoon - A full platoon of Planetary Militia with a unique miniature only found in this code. At the end of this month we will be putting up a free PDF containing basic background as well as armour, weapon and troop statistics for the Planetary Militia in Patrol Angis for you to use with your game books and miniatures. There will be more about the brave planetary defence forces once we reach our third book concerning the Shia Khan Empire when their noble tale is told in full. You have two weeks left to get the IMP22 Malig Campaigner free in any order or purchased on our website before it is withdrawn. It will form a part of the Year Two Collection in August 2015 though along with eleven other miniatures. Thanks for your custom and for the kind words about our products we do appreciate it. We work hard and we want you all to have fun with your wargaming in our space opera setting. Finally remember that by placing an order with us you will sign up for an account with the website and that means you get Reward Points in all purchases and the free monthly miniature too. These points can be used any time to get free products and discounts on orders. Nice options there. Rail gun for the win! Would you be able to clarify this description? "Weapons mount one of two ways with the gun shield fitted over them or around them." Thanks for your comment Alison. It means that the shield is fitted slightly differently (as with the Espaten) if you use one weapon rather than another due to shape. Its due to the variety possible. Its easy to spot upon assembly. The Fretan Railgun will come into its own when we get to larger vehicles as its the armour killer but for me the winner is the Bodkin Howizter...I love field guns!